THE PICKIEST EATER IN THE WORLD: LE PETIT SOUFFLE: SOUFFLE SO GOOD! 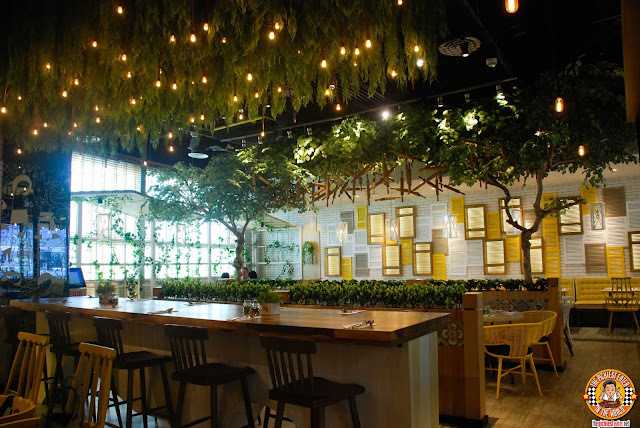 When Chef Mikko Aspiras personally sends you a message on facebook, inviting you to try his new concept restaurant, it's pretty hard to decline. 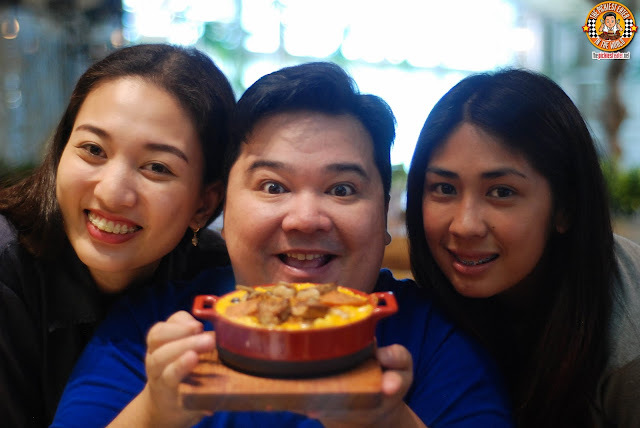 I believe this man could very well be on the top of the heap when it comes to the pastry game here in the Philippines (He made me a bacon Birthday cake to prove it! 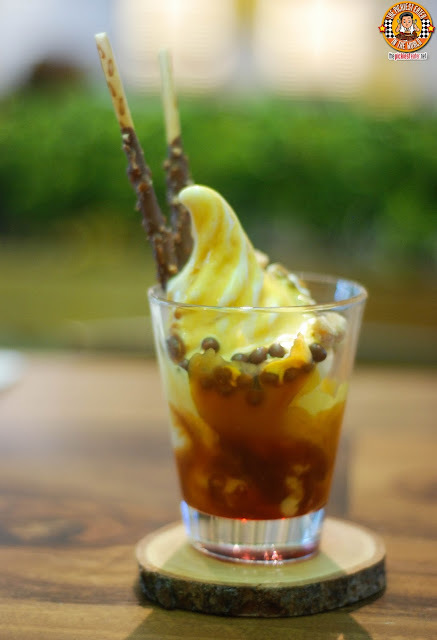 ), so you make time for his Japanese-French concoctions. 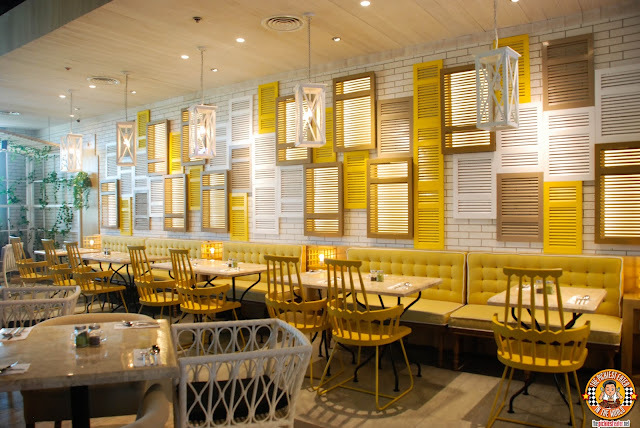 The bright ambiance and the infusion of greens made Le Petit Souffle look like an enchanted garden. The details, including the rolling pin decors to the vibrant colors adorning the walls added to the almost "Theme Park" feel to the restaurant. Clearly, this was going to be a dining experience unlike any other. So we began our meal with the Japanese Sweet Corn Potage (P195), which is what I had my eye on as my appetizer. 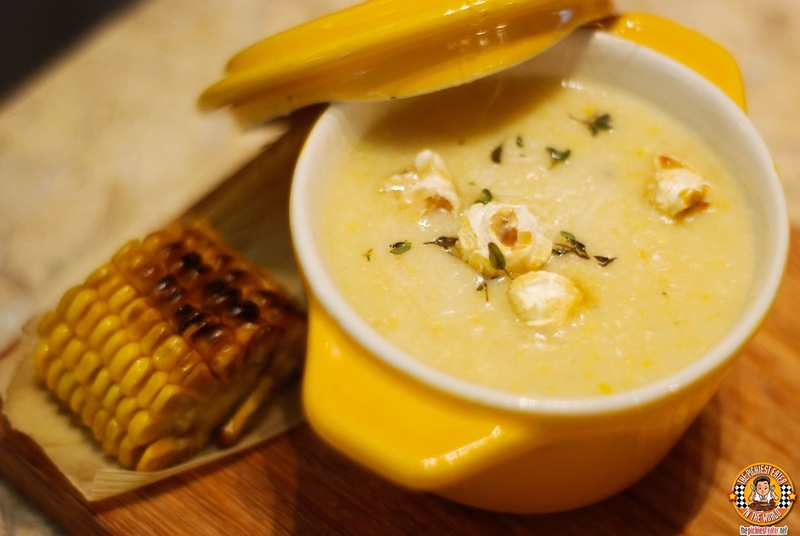 Sweet Japanese Corn, The corn is first roasted, before being creamed, creating a thick soup, then topped with Parmesan Popcorn and sprinkled with grated Parmesan. I'm not a huge soup guy, but I would say that corn is among my favorite, and Le Petit Souffle's Japanese Sweet Corn Potage is among the best I've tried. Right next to Corn, I also enjoy a good squash soup. 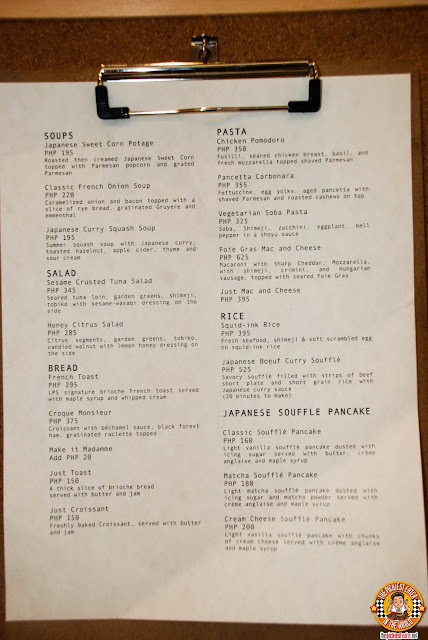 I found the Japanese Curry Squash Soup (P195) rather intriguing, because it combined the innate sweetness of a Summer Squash Soup and fuses it seamlessly with my fondness for Japanese Curry. 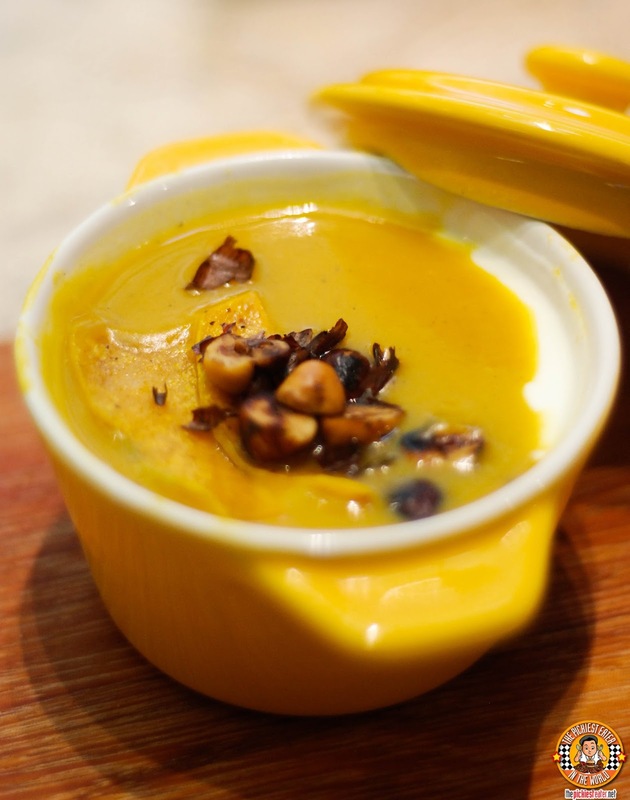 The thick soup is garnished with Toasted Hazelnut, a hint of Apple Cider to balance the richness, and a touch of Sour Cream. 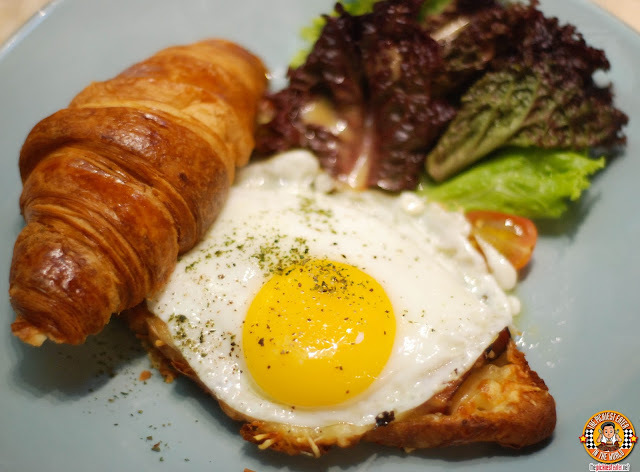 I'm a fan of sandwiches, which is why it was imperative for me to try the,Croque Madame (P395). The sandwich is actually their Croque Monsieur (P375) with the difference being the addition of a perfectly cooked fried egg. The sandwich uses a soft, buttery Croissant as its bread base, with a slice of a flavorful Black Forest Slice tucked between it. A rich Bechamel Sauce is poured over the ham, giving a wonderful accentuation of both creamy and light tartness, and finished with gratinated Raclette Cheese. A dish that I didn't try but my companions raved about, was the Squid Ink Rice (P395). I'm really not a fan of squid or squid ink, so I passed on this one. 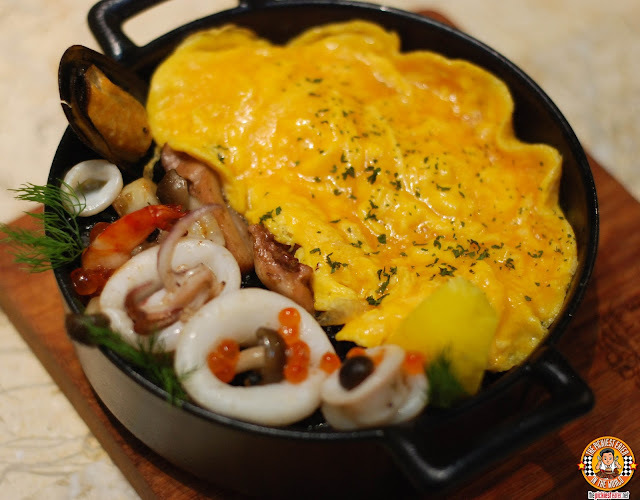 A medley of fresh seafood is laid on a bed of squid ink rice, peppered with Shimeji mushrooms, and covered in a soft scrambled egg blanket. 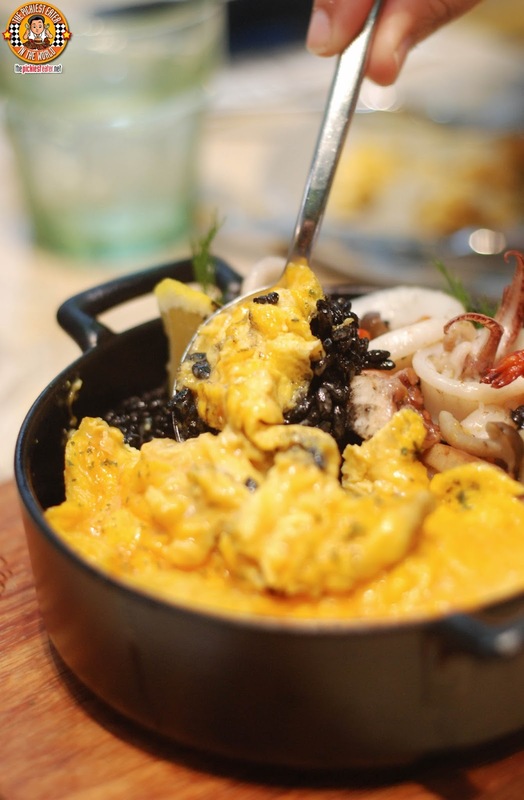 Even though I didn't eat the squid ink, I couldn't help but admire how gorgeous the scrambled egg was. My passing on the squid ink dish allowed me to save some stomach space for the Japanese Boeuf Curry Souffle (P525), which I absolutely loved. 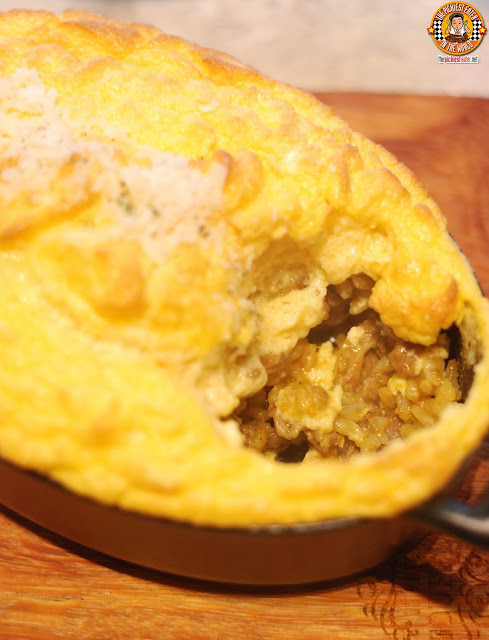 An incredibly fluffy souffle that reveals tender slices of beef short plate, mixed into a fragrant Japanese curry sauce. It's one of those dishes that demand you take another spoonful, despite the fact that you haven't even swallowed your first bite yet (Yeah, things got.. umm.. messy)! Out of all the dishes I tasted at Le Petit Souffle, I would have to say that the Pancetta Carbonara (P355) was the one I liked the least. Don't get me wrong, the dish was fine, but it didn't have the wow factor of the other dishes. 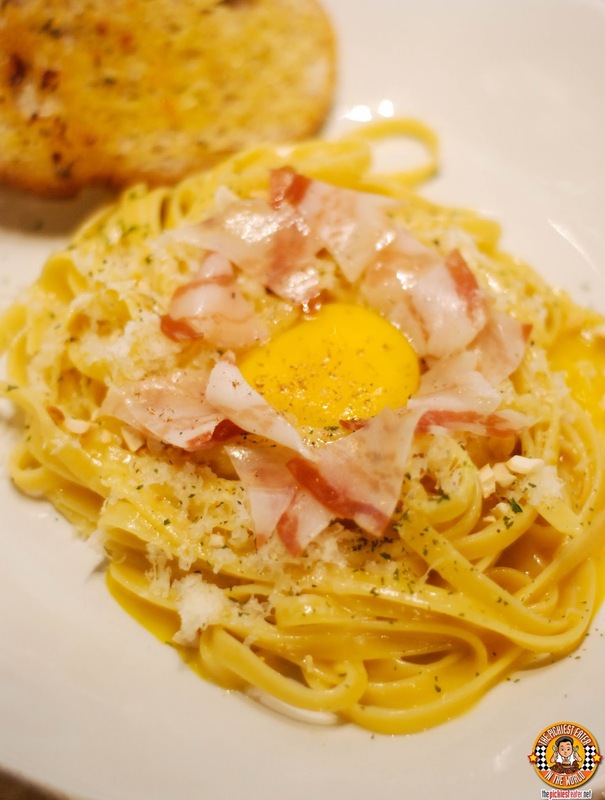 An egg yolk is placed in the center of a nest of al dente Fettuccine noodles, and topped with shavings of aged parmesan and aged pancetta that keeps the dish from becoming too cloying, and sprinkled with roasted cashews for added texture. 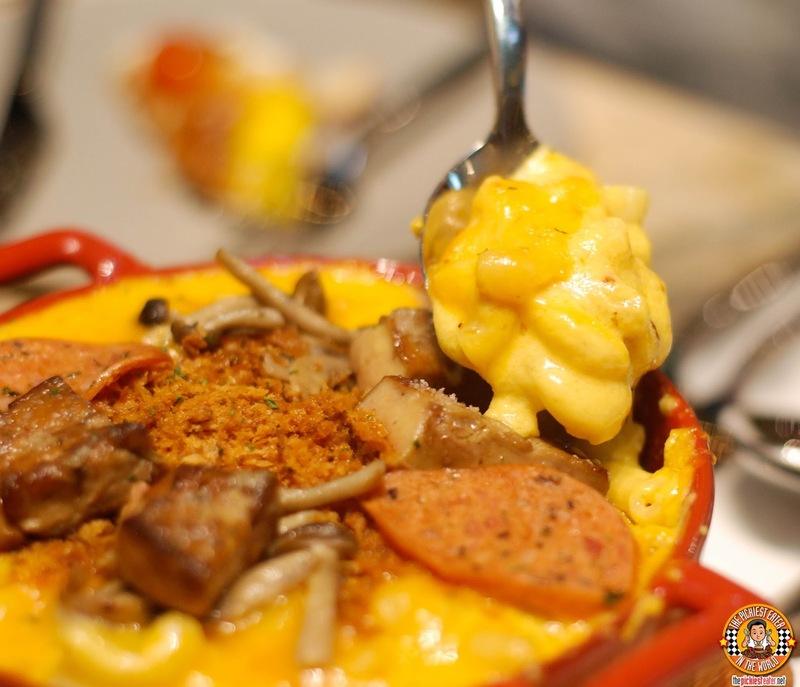 I normally pass on Foie Gras, but I had heard so many good things about Le Petit Souffle's Foie Gras Mac and Cheese (P625), that I knew I woujld regret it if I passed it up. Perfectly cooked Macaroni drowned in a mixture of Sharp Cheddar and creamy mozzarella, and accentuated by a combination of shimeji and crimini mushrooms. Slices of Hungarian Sausage and chucks of seared Foie Gras gives the dish an added savoriness to the dish. 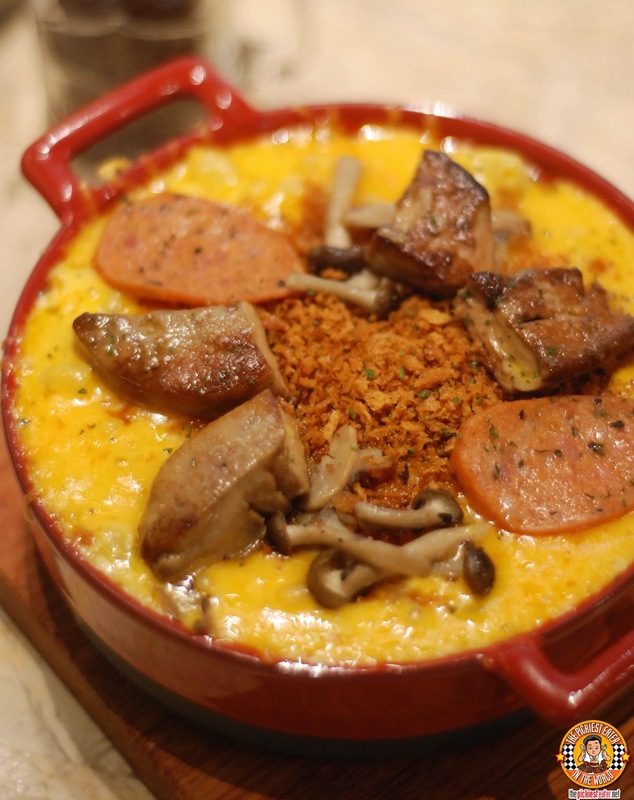 The Foie Gras virtually melts in your mouth, especially when you eat it with the macaroni. I can categorically say that this is one of the few Foie Gras dishes that I would eat without any sense of hesitation. 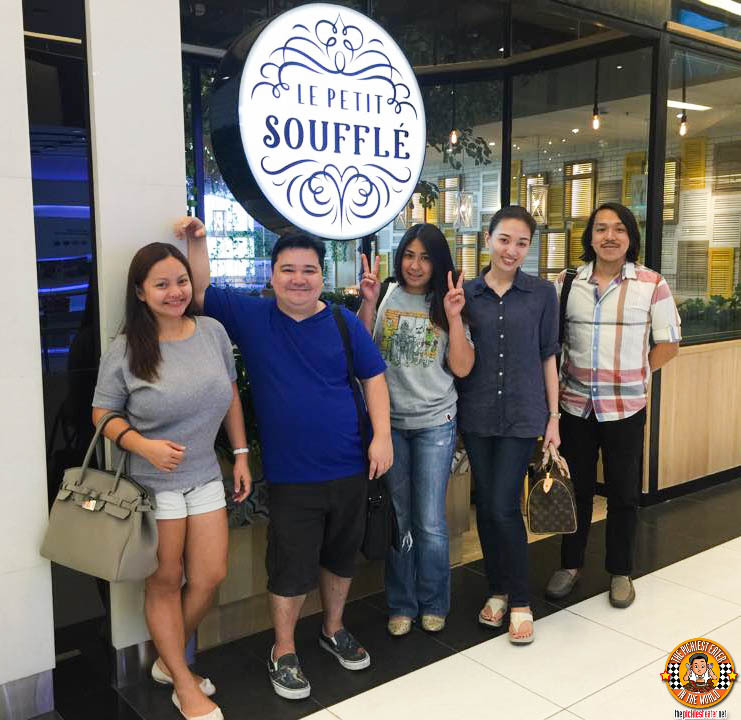 I think it only made sense that we tried one of the Souffle Pancakes of Le Petit Souffle, and we decided to go with the Cream Cheese Souffle Pancake (P200). Let me say it right now, these Souffle Pancakes are magnificent. 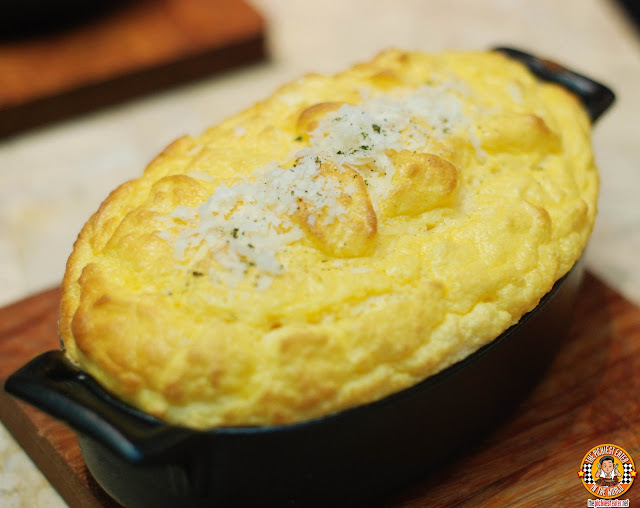 The Souffle is airy and light, with an innate Vanilla creaminess to it, and with a nice crust around the edges. 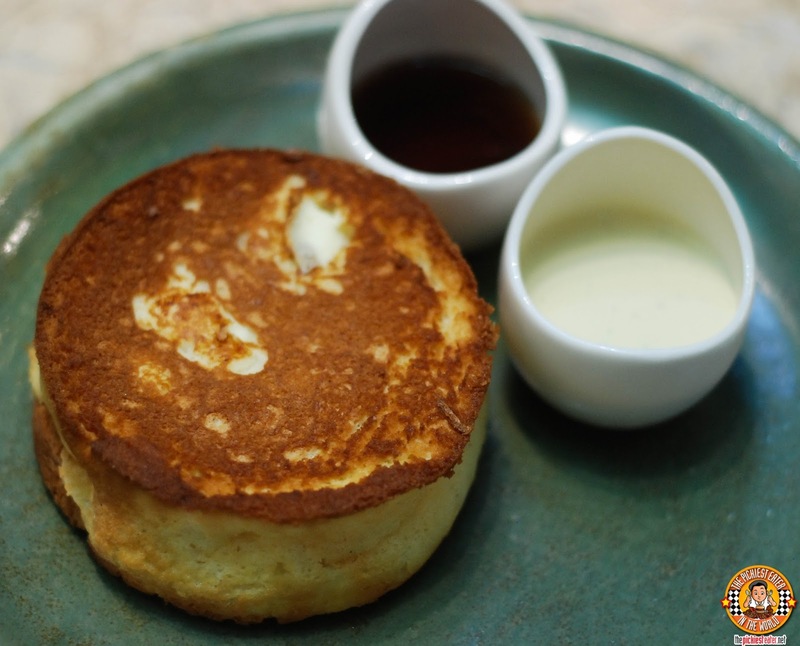 The Creaminess melds well with the Cream Cheese chunks that is cooked within it. The side of creme anglaise and maple syrup takes the flavor to a whole new level. Knowing that Chef Mikko is the man working his magic in the kitchen, I knew that the desserts of Le Petit Souffle would be INSANE. Well, I was right.. And if the Salted Egg and Caramel Parfait (P195) isn't a sign of Chef Mikko's madness, I don't know what is. 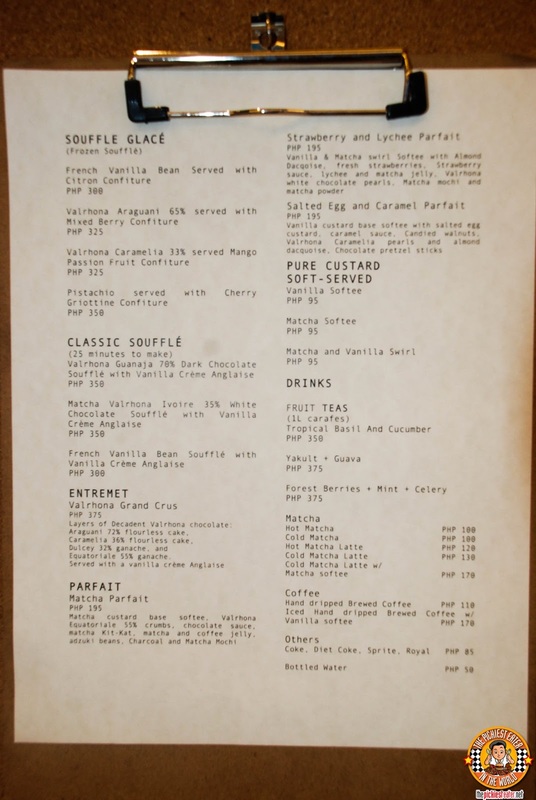 Chef Mikko takes a Vanilla custard based softee, and fuses the flavors with a Salted Egg Custard. He then pours a Caramel Sauce over the softee, and sprinkles it with candied Walnuts, Valrhona Chocolate, Caramelia Pearls and Almond Dacquiose, before finishing it off with Chocolate pretzel sticks. 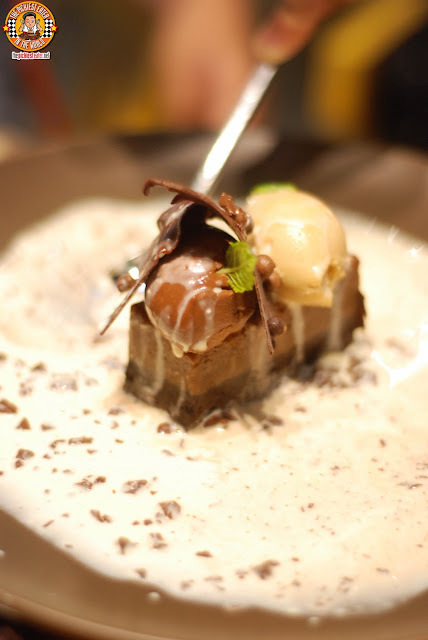 The insanity continued with the Valrhona Grand Crus (P375), a complex but tasty chocolate dish. 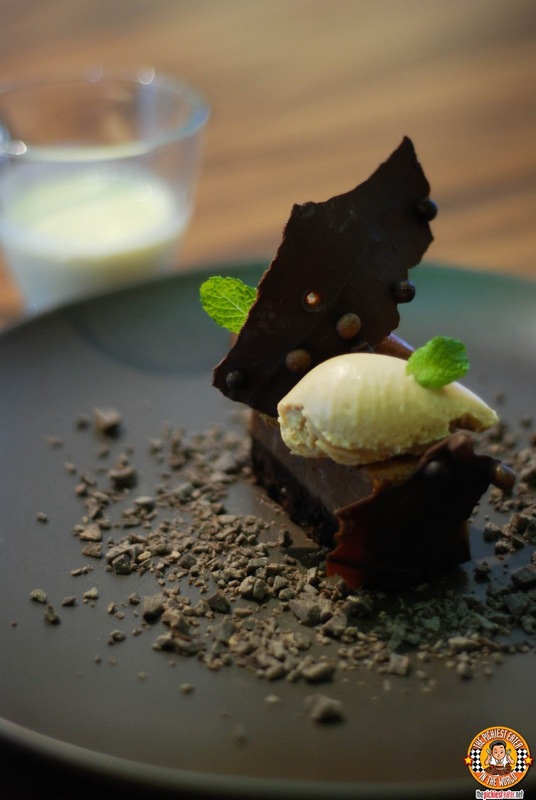 Layers of Valhrona chocolate is placed on a plate with bits of chocolate scattered around it. Once the Vanilla Creme Anglaise is poured on, you let the bits melt into it, creating something like a pool of chocolate milk for your cake. Chocolate lovers of the world will undoubtedly go nuts with this! Tito Richie and Tita Rina really had a great time with the KTG Babies! The Hype is real. 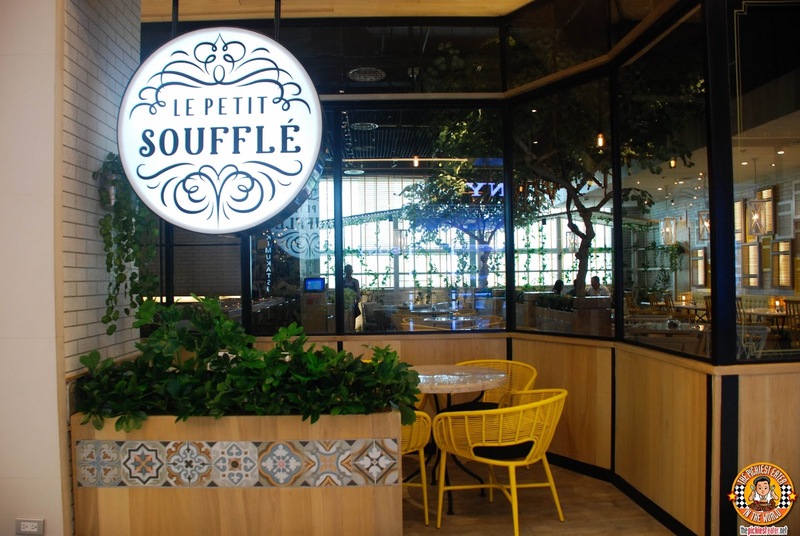 Le Petit Souffle is most definitely a restaurant that should be on your MUST VISIT list. Congratulations Chef Miko, Chef Kristine, Charles, Oya, and the rest of the Tasteless crew! Follow Le Petit Souffle on Facebook! October!!! haha! I love blogging but there's an even bigger adventure out there!